Directions: Select The Correct Answer. When Completed, Click On The Submit Button At The Bottom Of The Page. 1. Which is NOT one of the "Three Uses Of The Law"? 2. To whom did God give the Commandments on Mt. Horeb? 4. 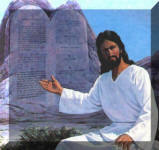 Why were The Ten Commandments written on Two Stone Tablets? 6.The primary focus of the First Commandment is to worship God every Sabbath. 7. One way we obey the Second Commandment is to pray to God regularly. 8. The Third Commandment reminds us that we have only one God. 12. One's reputation is protected by the Ninth Commandment. 13. "Coveting" means "to have an unholy desire for something or someone." 14. A "catechism" is a book of questions and answers. 15. All Christians number the Ten Commandments the same way. 17. The Ten Commandments were written on the hearts of Adam and Eve. love for us in Jesus Christ.